The Flying Spaghetti Monster Leaves Orbit! Since Voltaire, skeptics have recognized that the most effective argument is often mockery. Laugh, and the world laughs with you. Argue, and the other side is liable to argue back. This is why Steven Colbert, who as far as I can tell has nothing to say, is so popular. "Yes, if you choose to believe in the Flying Spaghetti Monster, an atheist will not necessarily understand why." Paul: Yes, if you choose to believe in the Flying Spaghetti Monster, an atheist will not necessarily understand why. David: While you may not have intended to be insulting, and I didn't take it that way, the "Flying Spagetti Monster" probably is inherently mocking. To take it more seriously than it probably deserves, though, one important difference between the spagetti monster, or the pink unicorn, and God, is that the former are arbitrary, while God is not. This is shown by the fact that a cohesive and consistent picture of God emerges in many cultures around the world. Dawkins and Dennett are ignorant of this fact (long since recognized by anthropologists), and it undermines one of their arguments against God. One of their own arguments against God rests on the premise that there is no such coherent picture of God. But the premise is false; therefore the argument they use to argue against God, if valid, is actually evidence FOR the existence of God. Even if that were so, that would still send the Spagetti Monster flying off into intrastellar space. Human beings have no spontaneous tendency to cook Italian spagetti, let alone believe in the Spagetti Monster; therefore, there is no parallel. For this and other reasons, an atheist SHOULD recognize the difference between God and the FSM. If in fact theism has a biological or psychological basis, he probable DOES recognize the difference, and simply chooses to pretend otherwise. If it has no such basis, then the coincidence among different cultures around the world is even more startling, and strongly suggests revelation. RF: I've heard you make this remark before concerning a supposed universality of the conception of God. I have no problem with religious people trying to find common ground with people of other faiths, but historically I don't see this universality (nor, by the way, did John Locke, for which reason he rejected innate ideas.). Of course, the three most populous religions of the world today--Judaism, Christianity, and Islam--do share a very similar conception of their respective gods, but this is easily explained by historical influence. But looking back historically, and not simply counting heads, we find very different conceptions of deities. One only has to look at the prevalence of polytheism in the ancient world coming out of the bronze age. So I find nothing that suggests historically the universality you claim. RF: Sorry about the second post, but your reference to a Stoic again raises a question, the one Paul was raising as well, as to whether identifying all these gods in different cultures as a reference to God as understood by a Christian is not a matter of ignoring the details. The Stoics were thoroughgoing materialists, and thus their god was understood as material, fire in fact, quite out of keeping with a Christian conception. One might also cite Aristotle's god. It would be entirely anachronistic to see this god as some equivalent to the Christian god. Aristotle's god is not a creator, not a governor of the world or designer of it in any sense, is not a loving god, not a judge of us or a source of moral standards. We can't gloss over such details, IMO. DM: As for the Stoic God, I think their physics was at war with their intuition on the nature of God, and the intuition usually won. Of course everything was made of matter for them. But their writings on God are very striking from a Christian perspective. You can make a case that they were materialist, polytheist, pantheist, henotheist, or just theistic -- though all our conceptions of those things are a bit out of pace with their metaphysics -- it was unique. But reading through their stuff, it's the theistic element that seems strongest to me. I'm including a discussion of this question in the paper I'm writing; I'd be interested in what you think about those two or three pages when (if) I finish. I really am enjoying those folks -- I feel deep admiration for their philosophy, which is one of the most heroic, yet also humble somehow, I've ever come across. RF: I'm still not convinced. There's also an issue of circularity to your argument. You admit that there isn't universal belief in a supreme deity, and thus admit to counterexamples. But with that in mind, you argument seems to boil down to something like this: in all cultures in which a supreme deity is recognized these deities are alike in that they are all conceived as being supreme. If you ignore the differences in detail, this is as far as I can see what your argument boils down to. As for the Stoic god, I would still stress the differences between it and the Christian god. Not only was it a material being, but like Aristotle's god it did not intercede in worldly events. It determines the natural order, but once so determined it does nothing to change that order. Thus like Aristotle's god, there is no point in prayer, since the Stoic god will not answer such prayers, and there isn't even a suggestion that it would hear a prayer. Like Aristotle's god, there is no suggestion of omniscience as Christians understand it. Again, the Stoic god is no moral judge, and no moral law giver. But further there are so many forms of religious belief: pantheism, monolotry, polytheism, and even forms of Buddhism that don't recognize a god at all, that it is hard to put much credence into your argument. And even if I gave up on these objections, and accepted that there is some general recognition of a supreme being among many cultures, what is implied by this? There are many explanations possible. But I'm glad to hear you enjoy the Stoics. They have always been a favorite of mine as well, particularly Epictetus. "Not surprisingly, since it is founded on local traditions of private revelation rather than evidence, the God Hypothesis comes in many versions. Historians of religion recognize a progression from primitive tribal animisms, through polytheisms such as those of the Greeks, Romans and Norsemen, to monotheisms . . . "
My response is (1) Dawkins is wrong, "historians of religion" mostly know now that the last item on his alleged progresssion often (even usually) comes first. (2) What he says about the "God Hypothesis" coming in "many versions" involves a major oversight: in fact there is striking agreement between hundreds of tribes on EVERY inhabited continent about the character of the Supreme God. It's not just that He's supreme. There's a whole list of characteristics that people around the world usually attach to the supreme God. (creator -- father -- good -- judge -- transcends cultures -- rewards kindness -- should not be worshipped with an idol -- among others) Durkheim gives a short list for Australian tribes, John Mbiti a long list for African peoples, James Legge and Vincent Shih give an almost identical list of characteristics for the ancient Chinese God. Lang showed that belief in a High God with similar characteristics was common around the world. Leading experts in different fields and of all viewpoints, like Mircea Eliade, Marvin Harris, Paul Radin, and Rodney Stark, have admitted the phenomena, though they've given different spins to it. At a minimum, it shows that the Judeo-Christian God is NOT arbitrary, or the product of one particular culture. The Stoic God was not, admittedly, conceived identically as Yahweh. Like many primitive concepts of God, also some from science, He was distant, and difficult to access. That's why the Christian faith came as "good news:" as Pascal put it, "not the God of the philosophers, but of Abraham, Isaac, and Jacob" -- the Christian revelation added to what the Greeks were already figuring out about God. But how can a Christian read what Balbus said here and not recognize who he is talking about? "Thus, if we every way examine the universe, it is apparent, from the greatest reason, that the whole is admirably governed by a divine providence . . . "
"To this skill of nature, and this care of providence, so diligent and so ingenious, many reflections may be added, which show what valuable things the Deity has bestowed on man." Cleanthes' Hymn to Zeus, and a lot that Epictetus says, is also in the same tone. I'll look at these passages more closely with your criticism in mind, though. Of course there are many forms of religion. And of course there are possible materialistic explanations for the fact that ONE concept appears in hundreds of cultures around the world -- I admitted that already. My points are, (1) Dawkins, and the FSM argument, depend on the concept of "God" being completely arbitrary, as the FSM is. (Why not a Flying Anchove Pizza Monster? A Gliding Okonomiyaki Monster? A Limping Taco Salad Monster?) But that concept is NOT arbitrary; the concept of "God" should therefore be held separate from culturally -determined devas and deities, like say Bacchus, or Kali, or Superman. (2) Christians predicted this phenomena; I know of no prominent atheist who did so, before the facts were know. (3) Certainly the phenomena makes the reality of God at least SOMEWHAT more credible. When they are ignorant of the phenomena, atheists like Dawkins argue quite readily that the culturally-determined and arbitrary nature of concepts of God consistutes evidence against the reality of God. Why should the argument only work if the data favors the atheist position? RF: First, monotheism was not new with the Stoics in Greek culture. It went back at least as far as Xenophanes. You might take this as some confirmation of your points, but I might point out that by in large Greek culture was polytheistic. Monotheism was a philosophical exception. Plato, whom you mention, in the Timeaus, thought that one could not understand the world without positing two gods, the Demiurge and the World Soul. Aristotle, as I mentioned before, thought you could get along with one, but then again his god was very unlike the Christian god. Now for the passage in particular. The "unity of good and bad" is not a hold out from pantheism or polytheism, although you're right there is much of this in the passage. A central doctrine of the Stoics was that things of themselves are "indifferent." They are only good or bad, beautiful or ugly, based on human judgment. This was critical to the Stoic ethic. All that is is necessary given the natural order. One cannot desire that the necessary not be (if one is rational). Thus what the common man calls "good" in the sense of desirable is in itself indifferent, as the "bad" is equated with the undesirable. This is the realization of the Stoic sage, who does not allow desires to differ from what actually occurs. Now, with respect to "ruler of all things," let us step back a moment and consider this historically. Was Yahweh the "ruler of all things"? He certainly doesn't appear to be so from the OT. He needs the aid of human action to take Palestine. He is more of the helpful general than in control of all. He certainly aids David against Goliath, but he doesn't do the deed himself. We simply don't get this notion from the OT. And it is understandable. From all that I've read, recent scholarly views are that the Israelites were not monotheists before the return from exile. At best they held to a monolatry. If Yahweh is not the only god, then Yahweh must struggle with other gods as humans struggled with other humans. So the notion of God as "ruler of all things" is not Yahweh. A second historical note. The Gospel of John is the first to refer to Christ as the "Word," or in Greek the "Logos." John clearly took this view from the Stoics, who took the view of the Logos from Heraclitus. So the historical record is not untainted here. This familiar theme of Christianity no doubt entered the religion from the Stoic Greeks. After all, the Jews were hellenized centuries before John. So if John was an educated Jew, he would understand much of Greek thought. If John were a converted Greek, then of course he would understand his intellectual culture. I appreciate that you brought your comments onto my "home court" as it were, philosophy. As I said, with the exception of a bit of Chinese religious belief I'm not well acquainted with nonWestern religion--a lack that I'd like to address before I die, perhaps even sooner. But I do believe that a claim of convergence of belief among cultures must be carefully scrutinized. There is much room to see superficial similarity. 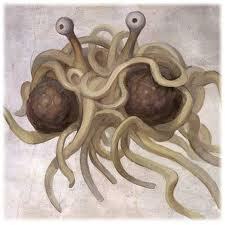 DM: Paul brought up the "Flying Spaghetti Monster." I responded by saying, "One important difference between the spaghetti monster, or the pink unicorn, and God, is that the former are arbitrary, while God is not. This is shown by the fact that a cohesive and consistent picture of God emerges in many cultures around the world." I also pointed out that Dawkins bases an argument against God on the lack of any such consistent picture. His premise being false, if his argument is valid, anthropology provides a useful (though admittedly not overpowering) argument FOR the existence of God. You admitted you sometimes use leprechauns for a similar purpose, and disputed the commonality or coherence of the image of God in various cultures. Since I've been reading Stoics lately, and since someone else brought up the Greeks and Romans, I offered a couple long quotes from Epictetus and Cleanthes to illustrate my point, and that's where the argument has centered since. I introduced Epictetus with the words, "But yeah, God keeps on breaking through to the Greeks and Romans, too." (1) "But Stoics may have influenced the early Christians, or Greeks may have been influenced by the Jews." True, but we're only talking about the Greeks, rather than the Chinese or Australian aborigines, as a concession to Western culture. (2) "But these folks have lots of gods, not just one." True, but that has nothing to do with my initial claim about God vs. FSM, or my later claim about God "breaking through" to the Greeks and Romans. (3) "But scholars think early Jews had lots of other gods, too!" True, and the Bible points that out forthrightly. But if the concept of God, as Christians and Jews hold it, really does appear widely in primitive times, then Hebrew (or American) idolatry can be regarded (from a theistic perspective) as a regression, as indeed the Bible depicts it. The issue is not "monotheism" vs. "monolatry," it is whether a consistent picture of God can be found in MANY cultures around the world. All right, here's Cleanthes again. Let me insert apparent points of commonality between Cleanthes' words about "Zeus," and what Christians say about God. I'll consider some of the points you dispute afterwards. Theistic expressions in Cleanthes "Hymn to Zeus"
we (11) alone of all mortal creatures that live and move upon the earth . . .
(12) goes wherever you lead it and is willingly guided by you. and with it you guide the universal (14) Word of Reason which moves through all creation . . . But you know how to make extraordinary things suitable, and (15) how to bring order forth from chaos; and even that which is unlovely is lovely to you. so that (16) the eternal Word of all came to be one. and yet, if they obey it intelligently, (19) they would have the good life . . ."
On the face of it, that's a remarkable amount of agreement. Some Christians, I think, would even find this quote threatening -- "how could a pagan know all that?" (5) "First cause of Nature . . . (15) you know how to bring order from chaos" . . . requires careful reading." In fact, the Stoics believe the world has "no beginning or end," and the "first cause need not be a creator." That may be. The congruence with Genesis 1 is, nevertheless, striking. "The earth was formless and empty . . . God said, 'Let there be light!'" God here is depicted both as a "first cause," and as One who brings "order from chaos." "Now, with respect to (6) "ruler of all things," let us step back a moment and consider this historically. Was Yahweh the "ruler of all things"? He certainly doesn't appear to be so from the OT. He needs the aid of human action to take Palestine. He is more of the helpful general than in control of all. He certainly aids David against Goliath, but he doesn't do the deed himself . . . "
"A second historical note. The Gospel of John is the first to refer to Christ as the "Word," or in Greek the "Logos." John clearly took this view from the Stoics, who took the view of the Logos from Heraclitus. So the historical record is not untainted here." John clearly did borrow the term "logos" from the Greeks -- actually all his words, apart from a few Aramaic insertions! And Philo and other Jews had used "logos" in some such way already, absolutely. But John is mainly echoing Genesis. "In the beginning God . . . " "And God said . . . " These two most powerful invocations translate brilliantly, clearly, succinctly into "In the beginning was the Word." So the real question is not why John sounds so much like Cleanthes, but why Cleanthes sounds so much like Moses. And I think my interpretation is the simplest solution, and fits a lot of other data, including the many remarkable confluences between Cleanthes' hymn and Judeo-Christian images of God. Remember, my original comment here was not, "The Stoic picture of God is exactly like the Christian," but "God keeps on breaking through to the Romans and Greeks." There's enough similarity here to support that contention, I think. "(1) Most glorious . . . " (a) or (b) Agrees with Stoic and Christian theism, and partially with Greek polytheism. Zeus is the chief of the gods, but as philosophers had long since recognized, the Homeric vision of his acts were not always very glorious. "(3) invoked by many names . . . " (b) or (c) While Greek gods were commonly identified with deities in other cultures known by other names, this seemed especially true of Zeus, and generally as a deity more closely approaches monotheism. The Bhagavad Gita takes this to an extreme: "Some bow to the countless gods that are only my million faces." (81) But the many names of God in Judaism, Islam, and Christianity, is also paralleled in Chinese theism, and by the common recognition among tribal peoples that God has many names. Paul also implied that even the name "Zeus" could refer to the One True God, as we will see. "(4) ever all-powerful" (b) Zeus is not all-powerful in Greek mythology; when he is described as such, he begins to take on theistic qualities. "(5) Zeus, the First Cause of Nature . . . " (b) Stoic philosophy agrees here with Judeo-Christian theology, against traditional Greek paganism. "(6) Who rules all things . . . " (b) or (c) The pagan Zeus does not do this; it is not clear in what sense the God of Stoic philosophy does, either. Of course this agrees with the J-C image of God. "(7) with Law . . . " (b) The Stoic and Christian God is lawful; Homer's Zeus passionate and rather lawless. "This again confronts us with the problem what it means for a Stoic to pray. In terms of the logic of a strict pantheistic system, a Stoic should have no need to pray: he has direct access to God within himself, since his reason shares in the divine logos . . . The fact that God is identified with fate furthermore appears to preclude prayer, for how can prayer change that which is predetermined by the very structure of the world?" "(9) from you we have our being . . ." (a) or (b) This is an interesting phrase. It has polytheistic parallels in Homer, Hesiod and Theolytus, where "genos" can be taken physically. But Paul also seems to echo it in Acts 17: 28: "As even some of your own poets have said, `For we too are his offspring.'" while Paul is (most agree) citing Aratus directly, as Thom puts it, "the plural `your own poets' suggest he may have had Hymn to Zeus v. 4a in mind as well." "(10) we whose lot it is to be God's image . . . " (?) Here I don't know the other tradition well enough to say. No necessary contradiction with Stoicism or paganism, but the parallel with Genesis is particularly striking. (11) we alone of all mortal creatures that live and move upon the earth . . . (?) This phrase underlines the Genesis parallel. Homer lacked such an exalted view of Zeus. He also seems to take a more active role than Stoicism proscribed. "(13) So great is the servant which you hold in your invincible hands" (b) The pagan Zeus was quite vincible. (contrary evidence?) "your eternal, two-edged, lightning-forked thunderbolt. By its strokes all the works of nature came to be established . . . "
Thom argues that his phrase reflects the Stoic connection of God to fire. 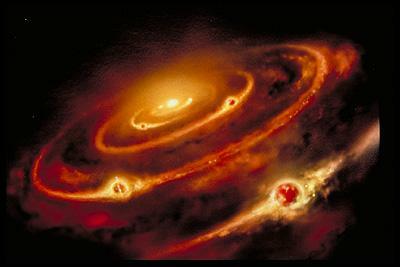 "(14) and with it you guide the universal Word of Reason which moves through all creation . . . " (b) OT theology anticipated the Stoic "logos" twice. First, it does so in the creation account, to which we have already referred, in which acts of creation repeatedly begin with, "And God said." Second in the Proverbs, in which Sophia (in the LXX) is a personified quasi-divine voice. "(15) But you know how to make extraordinary things suitable, and how to bring order forth from chaos . . . " (b) Zeus does not do that, for Homer. Stoicism here is "Moses in Attic Greek" - as Genesis describes: "The earth was formless and empty . . . and God said, `Let there be light.'" There are no doubt other parallels in Mediterranean thought, as you suggest. "(17) This Word, however, evil mortals flee, poor wretches; though they are desirous of good things for their possession" (b) or (c) This is one of John's favorite themes, but it predates Christianity in the Jewish tradition. I don't know how well it fits Stoic philosophy. I doubt the desire to flee Homer's Zeus would define a person as an "evil mortal." (18) "they neither see nor listen to God's universal Law;" (b) or (c) Law is a major theme of Psalms, especially Psalm 119. Also one of the themes of Romans 1-2, also of the prophets. "They have eyes, but see not." Again, this does not fit in with Greek paganism, but is another example of Stoic thought moving in the direction of a theism recognizable to Jews and Christians. "(19) and yet, if they obey it intelligently, they would have the good life . . ." (a) or (b) The gods reward, though not because of following "Law." Is my analysis of these points fair? Would you disagree with any of them, or can you tell me how to resolve those I couldn't classify? I'll add Epictetus, Balbus, and "Life of Zeno" to the mix later. Already it is clear that at least SOME Stoics agreed a great deal with Christians about God. Hope you don't find this boring, or feel that I'm trying to "colonize" the Stoics for Christianity -- I would admire them for their heroic ethics, even if I didn't find so many theological congruencies. But I'm finding this very interesting. Great post, though one note: Stephen Colbert is supposedly Catholic. Maybe a liberal Catholic, but wikipedia lists him as practicing, and a Sunday school teacher as well. Plus his show has had some otherwise unlikely guests, like NT Wright. Just a small note. As ever, I agree strongly with your general view here. Glad to see someone putting it out eloquently. Thanks, Crude. Now I'm glad I didn't say any more about Colbert. Maybe I'm just jealous -- I've tried to rope Wright into a couple of my own projects, with no success. I could go on. But suffice it to say this god character looks pretty arbitrary once you get to anything concrete about what it does or thinks. Compare it to, say Buddhist philosophy, which posits no father-god, earthly reincarnation between bodies and species, a strangely precise number of alternate planes of existence which to be reincarnated, or ancient Sumerian beliefs that humans were created by the gods to be slaves and experience nothing after death-- all of it looks quite absurd to someone who just wants good evidence for the first step along these crazy roads. Hence the Flying Spaghetti Monster and its ilk, concepts meant to emphasize the vacuum of evidence. Mow: See, here's the problem: you're mocking, not thinking. That's frankly not only why atheists don't believe in God, it's also why most people don't believe in atheists. I'm not sure where you get the "infinitely loving" or the "infinitely angry" from. Presumably the doctrines of heaven and hell? But that's simply the fact, apparent in life, that every gift is ambivalent. You give a kid a car, and he drives it to school and takes camping trips -- or he gets drunk and kills himself. The gift of eternal life might be like that, too. But I never talk with skeptics about eternity, until they've read C. S. Lewis' The Great Divorce. Animal sacrifice is built into human nature, and beats human sacrifice. Read Rene Girard, on that one. Anyway, you're flying off on a tangent. The issue here isn't God's specific dealings with the Jewish people. It's the general concept of God, that is shared by many cultures. If you consider how anyonen acts, you always find inconsistencies, especially if you're a kid watching her parents and not knowing why they do things. "She says she loves me, but she spanked me just because I wanted to play in that nice smooth asphalt outside! Waaahh!" On the contrary, I'm not mocking but listing the supposed characteristics of the god character as I have received them, as well as their logical implications. A god who sends a universal savior, with salvation contingent on knowledge and acceptance, but forgets about the Americas is by any reasonable accounting an arbitrary character. "I'm not sure where you get the "infinitely loving" or the "infinitely angry" from. " From Christians describing god's nature. If we're discussing the characteristics of the xian god, I don't know what other source to use. Of course, given the variety--and arbitrariness-of various xian sects' explanation of god's characteristics, that is hardly authoritative. The question of "how do you know" has not been satisfactorily answered by any Christian to my knowledge. "The gift of eternal life might be like that, too. But I never talk with skeptics about eternity, until they've read C. S. Lewis' The Great Divorce. " Given Lewis' faulty arguments (Liar, Lunatic, Lord and presuppositions about miracles) and his lack of understanding of science ("you can hardly imagine a bit of matter giving instructions" Mere Christianity, p. 25) I don't see any particular reason to treat him as authoritative on such a subject. Furthermore it's a pretty irresponsible parent who gives a gift that results in eternal pain. Most American parents would be horrified at the thought of giving their children laptops with a 1 in 100 chance of exploding and causing major injury, but we are supposed to see something as comparable to humans as humans are to ants as "good" because it's given us a "gift" with an indeterminate chance of eternal pain. "Anyway, you're flying off on a tangent. The issue here isn't God's specific dealings with the Jewish people. It's the general concept of God, that is shared by many cultures." I'm spelling out why atheists find Yahweh as arbitrary as the Flying Spaghetti Monster, as defined by the Judeo-Christian tradition. You can list consider the general similarities as much as you like, and that's certainly interesting--though I wonder what percentage of, say, African tribes subscribe to the supreme father-spirit-judge view: merely listing the similar views doesn't give a good overall picture--but that is somewhat irrelevant to Judeo-xianity's arbitrariness when considered holistically. Look at FSM-like characters more closely: Bertrand Russel's orbiting teapot highlights the undisprovable yet baseless and absurd nature of god-concepts; the Invisible Pink Unicorn highlights the undisprovability and the meaninglessness of god characteristics (it's invisible, but it's pink, while god is good, but doles out infinite punishment for finite crimes, along with a number of other problems). The Flying Spaghetti Monster, on the other hand, comes with its own cosmology. It created the earth, but was unsatisfied with it and so moved to heaven, which has a beer volcano and a stripper factory; it wants its message (the eight "I'd rather you nots", etc) to be delivered by people dressed in pirate regalia; it interferes with scientific experiments with its noodly appendage; and because of the decrease in pirates over the last several centuries, it has raised the temperature of the globe. Your long paragraph about hell just illustrates why I don't argue with atheists about the subject until they've read Lewis. Your two attempts to undermine Lewis' credibility are not only irrelevant but ridiculous: no one claims Lewis is a scientist, I didn't cite him as one, nor is your example of his error persuasive. We could argue about the trillemna, which as originally formulated was actually a good argument, but the irrelevancy of the comment makes me reluctant to do so. You're just looking for excuses. And your comment about eternal pain shows why you SHOULD read Lewis: you're attacking what for me is a straw man. I've already shown that the fundamental characteristics of God, far from being artitrary, transcend culture. There's a difference between character and specific actions, the latter of which will always seem arbitrary to someone who doesn't see the full picture -- which human beings don't. All these stupid analogies -- tea pot, spaghetti monster, unicorn -- succeed in nothing more or less than in showing why a lot of atheists aren't ready to be taken seriously, and don't really want to be. You can't scoff inanely and ask to be taken seriously at the same time. "Who? Me, scoff?" Right. No, Mow, you are mocking. No one says God is "infinitely angry:" that's your interpretation. So is "forgets about the Americas;" no Christian believes that. You have failed to understand my comment. 1. "Infinitely angry" is a description of God I have learned from Christians (No one says it? Were you there when I heard it?). It's not my interpretation. If you disagree with it, so be it, but I am not in the position to pick and choose which Christianity is correct aside from where it interacts with evidence. 2. Of course no Christian believes God forgot about the Americas. I was listing characteristics of God along with their logical extensions. That it forgot about the Americas is pretty clear from the fact that Christianity did not arrive for over a thousand years, and when it did it was accompanied by a genocidal plague. Hence, arbitrariness--regardless of what Christians believe about God's mental capacity. Does he have any evidence? What Native Americans wrote this down? Your two attempts to undermine Lewis' credibility are not only irrelevant but ridiculous: no one claims Lewis is a scientist, I didn't cite him as one, nor is your example of his error persuasive. Lewis offered those arguments as reason to believe his theology. Those arguments are flawed on several levels, not the least of which is his understandable ignorance of the workings of DNA and his less understandable ignorance of the brain. Why should I take Lewis' dreary "hell" over the eternal fire stuff when he seems pretty clearly at odds with most of the rest of Christianity and with the science he uses to support his conclusions? The best you've established is that people are likely to put concepts pretty basic to human social interaction and cognition --fathers, a sense of morality, hyperactive agency detection--into their spiritualism, and that Greek and Jewish thought unsurprisingly cross-pollinated (In my opinion, you can even see this in Genesis 6:4, which sounds a lot like a Jewish explanation of Greek gods and heroes). Furthermore you cannot establish "fundamental characteristics" of a character like "is good", independent of the evidence you're using. "God is good" is meaningless without God's interactions with humans and as it's described by humans--you're trying to simultaneously use and not use the biggest picture we humans have been able to establish. Apparently even mentioning these ideas more than briefly is inherently mocking, and so deconstructing the specific purposes of all these ideas by definition can't be taken seriously. That's what I gather from your response, as you seem to be unwilling to understand tone in this instance. You engage in a lengthy discussion in a forum thread and put up an entire post based on a discussion of what the FSM has to do with anything, and try to completely derail any discussion about it, or about God's characteristics. Maybe you need to take yourself less seriously, because you look pretty silly on several levels right now. Moe: Again, the reason I chose to focus on Greek theism was not because the same traits fail to appear in more distant cultures, but because I was talking with a philosophy professor who knew more about Greek philosophy than about other cultures. My own primary expertise is in China, which certainly did not "cross-polinate" on such a fundamental level with Israel, so early on. The ancient Chinese God, 上帝, also shared essentially the same characteristics, as did the Supreme God of many other cultures. So cross-pollinization doesn't work as a sufficient explanation. Now you seem to be looking for alternative theories. "The best you've established is that people are likely to put concepts pretty basic to human social interaction and cognition --fathers, a sense of morality, hyperactive agency detection--into their spiritualism . . . " Actually that doesn't quite work, either, because Greek (polytheistic) gods were NOT especially moral, nor does God trigger the "agency detection" sensor in the same way that, say, the god of the river is supposed to. There's nothing intellectually wrong with looking for fall-back theories, given your apparently strong commitment to atheism. My argument does not claim, by itself, to answer EVERY possible objection to Christianity. But you should recognize what you're doing. As for listing characteristics of God "along with logical extensions," I think you should keep the two separate, if you purport to be arguing against something a particular Christian is saying. Do you mind my calling you "Moe" BTW? I don't know what Mowicus means, and prefer shorter titles. "Moe" is fine, "Moewicus" doesn't really mean anything. I see what you mean, but let's make an analogy to a particular Christian sect, the Pentecostals. They take the "spiritual gifts" mentioned in Paul's letters quite seriously and see speaking in tongues as a sort of devotional exercise (as I understand it). I'm not asserting this as true because I haven't looked it up myself, but I've heard that a) the "tongues" individual believers speak in vary phonetically from congregation to congregation and that b) none of the languages bear the marks of grammatical structure as we find with human languages. If I'm arguing with a Pentecostal about their theology, it would seem relevant to include such (for the sake of argument) facts as "logical extensions" (not exactly a philosophical term, I know) of their theology--that apparently God (angels?) speaks in different nonsensical dialects to different congregations, exactly matching what we'd expect from learned behavior. Reading the Shangdi page on wikipedia, there are certainly interesting similarities between Shandgi worship and Judaism. Cross-pollination between the two seems vastly unlikely, though I wasn't arguing that it explains every similarity. It's true as you say that the Greek pantheon strikes a modern person as amoral or immoral, although I note that in the Odyssey, Odysseus opens up conversation with Polyphemus by appealing to Zeus' command to treat guests nicely, etc.. Of course, we can say exactly the same thing about the God of the Bible not seeming especially moral. Nevertheless, there almost always seems to be normative and human social psychology aspects to supernatural thinking. Overall I don't see how the Fulfillment theology God is distinguished from the hypothesis that humans have a relatively limited range of imaginative archetypes and thus will come up with a range of similar ideas with culturally arbitrary specificities piled on (Harry Potter as the individual selected by chance or destiny to defeat a great evil is just inherently more interesting than his Uncle Vernon hitting Voldemort with his car on the way to get groceries, thus averting all the events of the books). One thing that would be very interesting: solid evidence that Native Americans knew about Jesus well before the Columbian Exchange. It wouldn't necessarily be proof of the supernatural, but it would certainly be very interesting.